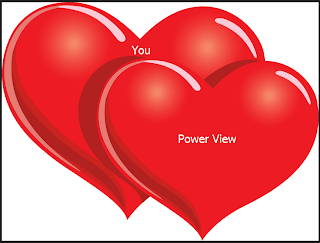 Fall in love with Power View this Valentine's Day. Thursday February 14, 2013 at 11 am est I am presenting Self-Service Visualization with Power View as part of Pragmatic Work's Free Training on the T's (Tuesdays and Thursdays). In this session I will give a brief history of Self-Service Visualization and some tools out there today that facilitate it. I will then introduce Power View and the two ways it can be used; SharePoint 2010 (or 2013) and now Excel 2013. I will then cover what sources can be used to create a Power View report then jump into a demo and create a few visualizations from a blank canvas to demonstrate how easy, yet powerful this visualization tool really is. Hope you can attend! You can register by clicking here.